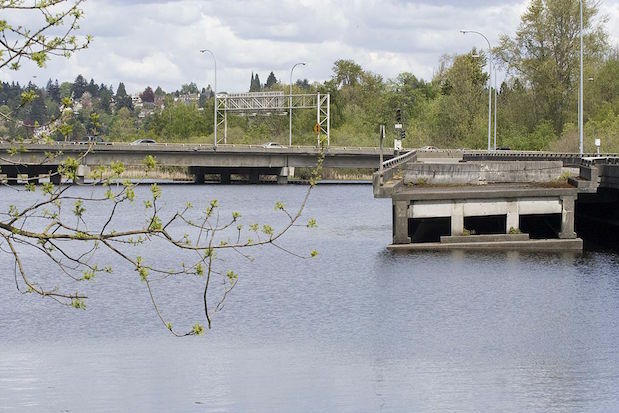 As the Highway 520 expansion project goes forward in the Lake Washington Arboretum and the Montlake area, the idea to find a way to save a piece of the old “Ramps to Nowhere” is becoming more urgent. The ramps are currently all scheduled to be demolished. The idea of saving a ramp remnant has been percolating for years. Why preserve parts of an old unfinished freeway in a beautiful park? Dialing back to the 1960s, the citizens of Seattle voted to build an expressway system that included the so-called R. H. Thomson Expressway, which would have cut through the heart of the Arboretum and cleaved through Montlake, Madison Valley and the Central District. The idea was to ring Seattle with old-school expressways. But, not unusual in Seattle, folks had second thoughts. When the 520 bridge was constructed in the early 1960s, ramps expected to connect to the planned R. H. Thomson expressway were built. But a group of citizen activists, local residents, neighborhood representatives, UW students and faculty, and groups like the Black Panthers rose up and objected to the Thomson and literally blocked the bulldozers as they were about to roll. Fueled by the rethinking that occurred as environmental consciousness blossomed in the ‘60s, successful anti-expressway efforts of people like Jane Jacobs in New York who had shown the negative impact on the urban fabric of more concrete for cars, and with assistance from activists trained in the grassroots tactics popularized by Saul Alinsky in Chicago, Seattle’s volunteers were able to shift public opinion, City Hall, and push back the road-centric ambitions of the Washington Department of Transportation. The expressway was stopped. The ramps remained. People have used them for diving into Lake Washington, but they also stood as relics to a discredited version of urban renewal and the success of ordinary citizens in stopping a bad idea. The embodied a great civic story. The state has been moving ahead with the intent to remove all remnants of the ramps. But A.R.C.H. wants a few to remain standing. There is precedent for this. Gas Works Park consists of the ruins of an old refinery. English gardens often contain a decorative structure or imaginary ruin—a folly—to add a sense of romance and mystery. In San Francisco, one of the great local landmarks is the Palace of Fine Arts, a structure that was designed to be a temporary “ruin” for a world’s fair in 1915. People liked it so much that the “ruin” was restored to be permanent—a permanent ruin. It’s a beloved icon of the city and the Marina district where it stands. Such things are completely appropriate in parks, and few have the message about democracy that our ramps do. Seattle has a wonderful tradition of citizen activism. Citizen activism has helped achieve civil rights and open housing in Seattle, obtained the $15-and-hour minimum wage, saved the Pike Place Market and Pioneer Square, is leading the fight against coal and oil trains and Arctic drilling, and has advanced the cause of police reform in terms of race and violence. We’ve also become a bikeable, transit-oriented city—the very antithesis of the future the R. H. Thomson promised. Preserving the dead freeway ramps is more than whimsy—it would be a monument to the power of the people at the site of one of the most remarkable victories. The members of A.R.C.H. will be contacting the city council this month for their support. The council can demand that WSDOT preserve a section of the old ramps—some columns and crossbeams—to ensure the folly of this folly is remembered every time someone visits the Arboretum and asks, “what the hell?” The story should continue to inspire the next generations.